Five more days and I will be having the perfect blend with my friend Karen! Okay probably 6 since I don't get into Orlando until almost midnight, I am so ready for vacation!! I couldn't resist the Perfect Blend stamp set from Stampin Up when I had my online party. I have thought about ordering it several times and caved when I knew I could get it with hostess dollars. I already have the digital version and got it since there was an SVG file for it. I imported the SVG version into Make The Cut and then used my Stamp-Ma-Jig to stamp the image on what I had cut. I think it turned out pretty good. It sure gives it more dimension and makes it a lot easier for me to add the lid and label. I used Promarkers to add the shading on the cup and label. My friend Carmen thought I had colored the whole cup and I had to let her know I had stamped it on some brownish paper and then just added the shading. 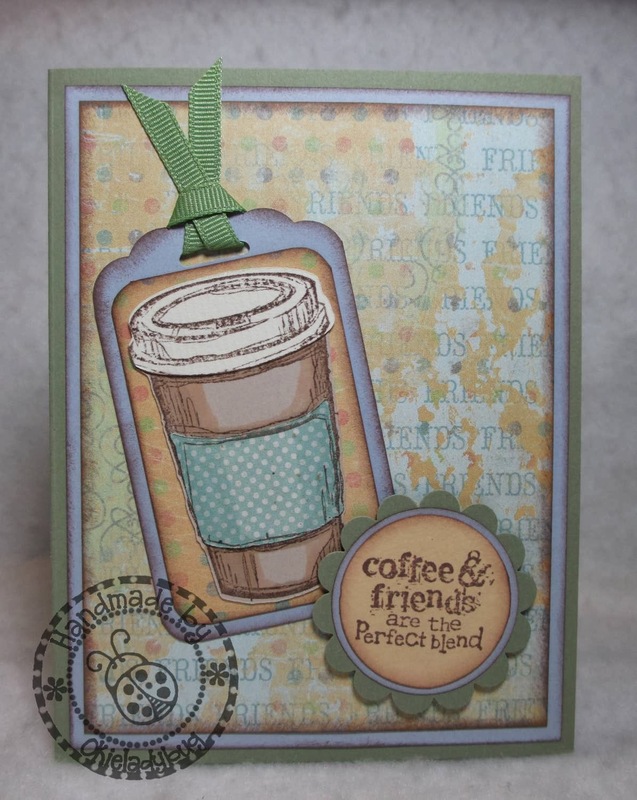 I also used my new Stampin Up Scallop Tag Topper punch to make the tag. I know I am going to be using it alot since it makes it so easy to make tags. I also did an image search and there are a lot of other cute things you can make with it as well. Such a great card ! Love the colors as well as the design and sentiment ! I Want that so bad! Where you going to get that before I mentioned it to you? The stamp set or the tag punch? Makes me want a latte right now! Love this card. mmmmm .... I am a major coffee drinker. I like tea too, but nothing is better than that morning cup of coffee (or two, or three). So it goes without saying that I love this card. Great job on the coloring/shading, I want to reach through my puter screen, wrap my hand around that cup, pull it to me and enjoy a nice long sip of that beautiful hot java. Love the stamp set and the card. Great idea to add the shading. Adds lots of dimension!